Egypt’s ruling military council has asked a former prime minister, Kamal al-Ganzouri, to form a new cabinet, the Al Jazeera network reported on Thursday. 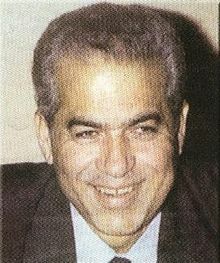 Ganzouri headed the government from 1996 to 1999, under former president Hosni Mubarak. Al Jazeera cited a report on the website of the state newspaper Al-Ahram, which quoted sources close to Ganzouri who confirmed that he had had agreed in principle to lead a national government. The photo above is older and so is Mr. al-Ganzzouri: He’s currently 78 years young. Back in the day, before getting tabbed as Egypt’s Prime Minister, this guy was ‘The Minister of The Poor’ and ‘The Opposition Minister’. Dang, those titles sound an awful like what a community organizer would be involved with, eh ? The more things ‘change’, the more they get crammed full of ‘hope’…… or something like that. Meet the new boss……… He was the old boss……… Egypt’s getting fooled again. This entry was posted on Thursday, November 24th, 2011 at 20:48 and is filed under Main Postings. You can follow any responses to this entry through the RSS 2.0 feed. You can leave a response, or trackback from your own site.